Does cannabis offer health benefits? Americans overwhelmingly approve of medical marijuana, and 29 states and the District of Columbia have legalized it, allowing doctors to recommend marijuana products to registered patients. Research shows some forms of marijuana, including a synthetic drug, help treat a few conditions, including chronic pain and chemotherapy-induced nausea. But solid research is limited for other forms, such as smoked or vaped marijuana, and for conditions such as post-traumatic stress disorder, for which states have approved marijuana use. 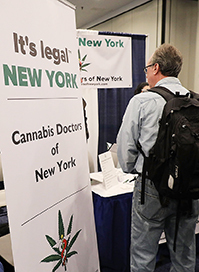 Nevertheless, medical marijuana advocates want all states to legalize it, while opponents say only the Food and Drug Administration should approve drugs for medical use. Yet, federal rules make the studies the FDA relies on difficult to undertake. Complicating the situation are Trump administration efforts to end Obama-era policies curtailing prosecution of medical marijuana in states where it is allowed. Caught in the middle are doctors, who worry they can land in legal trouble if they discuss marijuana with patients, and patients, who must rely on advice from cannabis dispensaries.